On 27 May the Vanuatu Geohazards Observatory stated that the Alert Level for Suretamatai was increased to 1 (on a scale of 0-4) because of a change in activity. VGO reminded residents and tourists that areas around the volcano and along the Sulfur River (E flank) were high-risk zones due to potential impacts from volcanic gas emissions. "During our survey, no change in activity at the major geothermal areas (Frenchman's Solfataras and Hell's Gate) was noted, with respect to descriptions by Aubert de la Rue (1937) and Hochstein (1980). Slightly superheated fumaroles (with sulfur deposits), hot springs, and boiling ponds up to 3 m in diameter occurred over a 300-m strip along the Sulfur River (E flank) between 300 to 400 m elevation. The temperature of the Sulfur River at Hell's Gate remained stable at 50°C. References. Ash, R.P., Carney, J.N., and MacFarlane, A., 1980, Geology of the northern Banks Islands: New Hebrides Geological Survey Regional Report, p. 1-47. Atkin, J., 1868, On volcanoes in the New Hebrides and Banks Islands: Proceedings of the Geological Society of London, v. 24, p. 305-307. Aubert de la Rue, E., 1937, La Volcanisme aux Nouvelles Hebrides (Melanesie): BV, v. 2, p. 79-142. Hochstein, M.P., 1980, Geology of the Northern Banks Islands: New Hebrides Geological Survey Regional Report, p. 47-49. Information Contacts: C. Robin and M. Monzier, ORSTOM, Nouméa, New Caledonia; M. Lardy and C. Douglas, ORSTOM, Vanuatu; C. Mortimer, Dept. of Geology, Mines, and Rural Water Supply, Vanuatu; J. Eissen, ORSTOM, France. Suretamatai volcano forms much of Vanua Lava Island, one of the largest of Vanuatu's Banks Islands. The younger lavas of 921-m-high Suretamatai (also known as Soritimeat) volcano overlie a number of small older stratovolcanoes that form the island. In contrast to other large volcanoes of Vanuatu, the dominantly basaltic-to-andesitic Suretamatai does not contain a youthful summit caldera. A chain of small stratovolcanoes, oriented along a NNE-SSW line, gives the low-angle volcano an irregular profile. The youngest cone, near the northern end of the chain, is the largest and contains a lake of variable depth within its 900-m-wide, 100-m-deep summit crater. Historical activity, beginning during the 19th century, has been restricted to moderate explosive eruptions. Ash R P, 1971. Vanua Lava. New Hebrides Geol Surv Ann Rpt 1970, p 7-12. Ash R P, Carney J N, Macfarlane A, 1980. Geology of the northern Banks Islands. New Hebrides Geol Surv Reg Rpt, 49 p.
Eissen J-P, Blot C, Louat R, 1991. Chronologie de l'activite volcanique historique de l'arc insulaire des Nouvelles-Hebrides de 1595 a 1991. ORSTOM Rapports Sci Tech Sci Terre Geol-Geophys, 2: 1-69. New Hebrides Geological Survey, 1978. Geology of the Banks Islands. New Hebrides Geol Surv, 1:100,000 geol map sheet 2. Robin C, Monzier M, Crawford A J, Eggins S M, 1993. The geology, volcanology, petrology-geochemistry, and tectonic evolution of the New Hebrides island arc, Vanuatu. IAVCEI Canberra 1993 excursion guide, Aust Geol Surv Org, Rec 1993/59, 86 p.
There is no Deformation History data available for Suretamatai. There is no Emissions History data available for Suretamatai. The southern two-thirds of Vanua Lava Island is seen in this NASA Space Shuttle image. Suretamatai volcano forms much of the island, with the most recent activity occurring in the northern part of the island, near the area with small cloud banks at the top of the image. 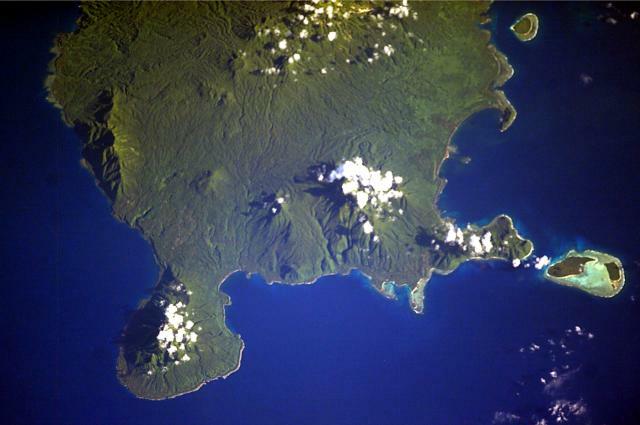 The Pleistocene Ngere Kwon volcano forms the peninsula at the bottom of the image, and small offshore islands at the right are uplifted reef limestones. Historical activity, beginning during the 19th century, has been restricted to moderate explosive eruptions. NASA Space Shuttle image ISS006-E-40035, 2003 (http://eol.jsc.nasa.gov/). There are no samples for Suretamatai in the Smithsonian's NMNH Department of Mineral Sciences Rock and Ore collection. Large Eruptions of Suretamatai Information about large Quaternary eruptions (VEI >= 4) is cataloged in the Large Magnitude Explosive Volcanic Eruptions (LaMEVE) database of the Volcano Global Risk Identification and Analysis Project (VOGRIPA).